Hello fellow scrappers, my name is Karan Gerber, and I reside in Sebringville, Ontario Canada. I live here with my hubby Glenn and our two boys, Elijah (15) and Galen(12). My family is the main source of my inspiration and you will often see their smiling faces adorning my projects. My love for this hobby started over 12 years ago and I can say I am totally addicted! I love to work with double page layouts, cards, canvas and mini albums. I enjoy finding a unique way to work with embellishments and you will often see many layers to my work. Distressing, ink, mist and paint are just some of the added details I like to play with. I am very excited to be part of the Design Team for 2012 with Quick Quotes and look forward to inspiring you! Please welcome Karan to the Quick Quotes Team! Welcome Karan! so excited to be working with you at Quick Quotes. Karen... love your work! I am excited to work with you and learn from you this year! Congrats on the DT role! Looking forward to seeing your projects over the coming months! Look forward to you embellishing the DT. thank you so much to Quick Quotes for the wonderful opportunity, i look forward to working with everyone this year. Hi Karan!!! i'm looking forward to working with you. Karan, I love your work!!! I am so excited to get to work with you! Congratulations on making the team, Karan. 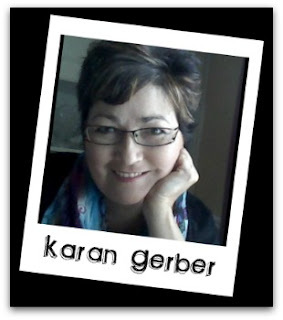 Congratulations and welcome aboard Karan! It was so much fun getting to know you a bit better!!! Can't wait to see your next lovely creation using Quick Quotes!